Limited water supplies and competing agricultural, environmental, industrial, and municipal interests challenge Australia’s water-trading system. New South Wales began capping water-use licenses in 1977, with a full moratorium in place by 1981. By 1983, the Australian state was allowing water allocations to be traded, and private users could trade private entitlements by 1989. Click image to enlarge. The end of Australia’s worst drought of the modern era has stirred a new chapter in a long national debate about whether the nation’s carefully regulated system of trading water rights is the best — and perhaps the only — way to manage water during times of acute shortage. Supporters argue that the system promotes sustainable water use and spurs innovation by directing water toward uses with the highest economic returns. But serious challenges remain as the country balances environmental limits, municipal needs, agricultural production, and a growing mining sector driven in large part by Asian imports. In the end, the ultimate success or failure of Australia’s water market may help determine whether others around the world follow suit. 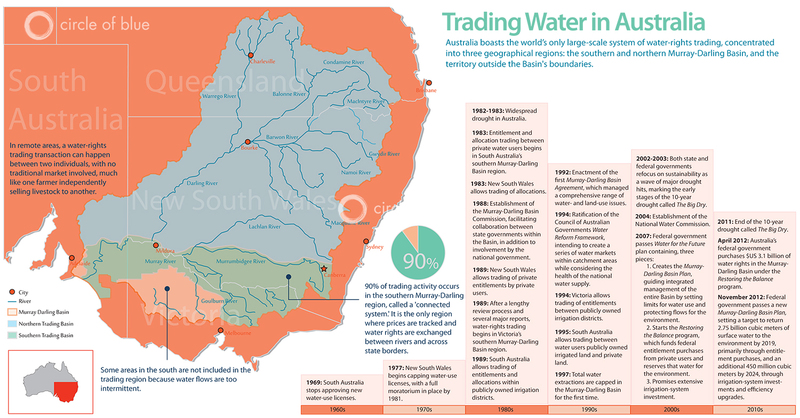 Over the course of 30 years, basin by basin and state by state, Australia developed and implemented the world’s only large-scale system of water trading. 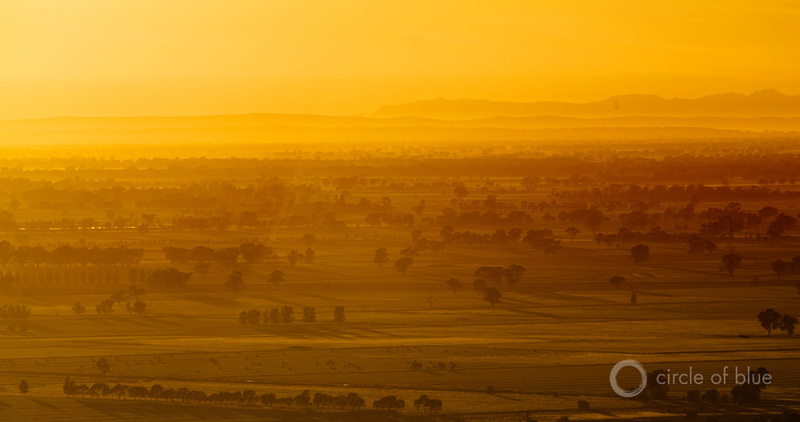 As the cornerstone of the nation’s water-management plans, Australia’s markets are divided into three categories covering hundreds of watersheds: the southern and northern Murray-Darling Basin systems, plus the territory outside the Basin’s boundaries. Worth roughly $US 26 billion, the system is meant to manage water use in an uncertain supply environment. Nothing illustrated that unsteady supply better than the 10-year drought from 2000 to 2010, when below-average rainfall dried out the Murray-Darling Basin, Australia’s most populated and fertile region. During what is now known as The Big Dry, water-rights trading expanded as overall supply diminished. Though the rains have come and the drought is now over, the federal government just this past November passed a major plan for water conservation in the Murray-Darling Basin. As it is implemented over the next six years, this plan will depend heavily on the water-rights market to reserve water for environmental flows. It seems as though Australia’s water markets are here to stay. “The philosophy across state governments and the commonwealth here in Australia, and across both sides of our political divide, is that the market should be the mechanism that allocates this scarce resource,” said Kim Morison, managing director of Blue Sky Investments, an Australian water-rights trading company. In Australia’s markets, every user must adhere to a state government-regulated limit on how much naturally available water can be used. Within that framework, users — be they farmers, mine operators, or city-dwelling individuals — can trade amongst themselves for short- and long-term rights to that water. Every large water user in Australia watches water prices as carefully as those of fuel and electricity, because each sector is competing with the others for limited resources. In other words, anyone who wants to use more water must first work out who will be paid to use less. Entitlements: Every water user within a basin, or catchment area, owns a share entitlement. That entitlement determines how much water an individual can use, based on the total volume of water available in a basin in any given year. Entitlements are permanent, perpetual water rights that are held as permits with a state government. Another way to think of an entitlement is as a pool of water that is promised to a user every year — but the pool changes size, depending on how much total water there is that year for everyone who owns a pool in a specific basin. Users can sell these permanent rights to one another, or the government can purchase rights from private users and reserve that water for the environment. Allocations: Entitlement holders can exchange allocations, or volumes of water that are traded to deal with immediate, day-to-day supply issues. Allocations are exchanged between entitlement holders in a one-time transaction. Sticking with the above example, this essentially means that one pool (entitlement) owner can buy a metaphorical bucket of water (allocation) from someone else’s annual pool (entitlement), but this is a one-time sale. In other words, a new deal would have to be brokered to get that same bucket of water again next year. Owning entitlements in Australia is a lot like owning shares in a company on the U.S. stock market, according to Mike Young, a professor of water and environmental policy at the University of Adelaide. Map: Australia boasts the world’s only large-scale system of water-rights trading, concentrated into three geographical regions. Click the image to enlarge. First, state governments determine the total quantity of water that will be available to users in a given year. Then, entitlement holders receive their allotment of water in proportion to the number of shares that they hold. Markets are concentrated in three regions — the southern Murray-Darling Basin, the northern Murray-Darling Basin, and the territory outside the Basin’s boundaries — and these markets differ in one fundamental way from U.S. stock markets: buyers and sellers negotiate the transaction price themselves, the markets just facilitate transactions and track prices. In remote areas, however, a water-rights trading transaction can happen between two individuals, with no traditional market involved, much like one farmer independently selling livestock to another. Parched Australian lands during the height of The Big Dry in 2009. Click image to enlarge. One program in Australia’s Murray-Darling Basin models a price-oriented mechanism for trimming over-allocated water rights. “Restoring the Balance in the Murray-Darling Basin” began in 2007 and will run through 2017. The program allows private users to sell their water entitlement share — or the share of the available water that the state government says they can use that year — back to the state government using national government funds. Wes Strickland, a water lawyer based in California, has followed Australia’s market system closely throughout its 30-year evolution. The markets in the Murray-Darling Basin as it exists now, Strickland told Circle of Blue, were actually developed over the past three decades so that the government could reduce overall diversions from the river system to protect the environment. “That was the whole purpose of it — have the government essentially buy rights out of the system by purchasing rights from willing sellers at the most competitive terms,” Strickland said. The first-of-its-kind balancing reform program set aside $US 3.1 billion for repurchasing over-allocated water, modeling a way that valuing water can promote the long-term health of a water supply — in this case, Australia’s largest river basin. The initiative also included investing in more efficient irrigation mechanisms in the Basin. This reform in the Murray-Darling region is a fundamental piece of the 10-year government initiative called “Water for the Future.” It operates in parallel to the larger “Restoring the Balance in the Murray-Darling Basin” plan. The first 50 percent of water that flows through the Murray-Darling Basin is reserved for environmental flows — a number based on long-term averages, said Kim Morison, managing director of Blue Sky Investments, an Australian investment company that trades water rights. The quotient must be satisfied before water is diverted to consumptive uses. Similar limits exist beyond the Murray-Darling Basin, and the timing and amounts varies by river system. In the Murray-Darling’s northern region, markets allow private users to trade water from the same river, but not between rivers, according to Morison. In the southern Murray-Darling’s so-called “connected” trading region, prices are tracked and water rights are exchanged between different rivers and across state borders. 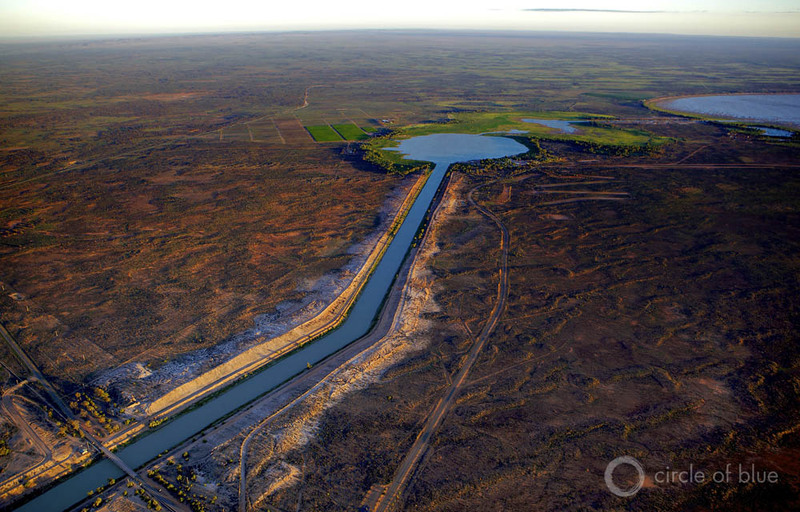 As a result, trading in the southern Murray-Darling, according to a 2011 National Water Commission report, accounts for 90 percent of activity in Australia’s water markets. Still, the connected trading region does not cover the entire southern Murray-Darling Basin, because some areas have water flows that are too irregular. The federal government has spent billions of dollars to buy permanent water rights, primarily in the Murray-Darling Basin, to protect the environment. The other half of the total available water in any Australian basin is divided into individual, useable entitlements. As author Charles Fishman put it in his 2012 book, The Big Thirst, every drop of water in the Murray-Darling Basin and others like it is owned, either by the government or by individual users. Once the government owns water, individual users cannot purchase it back. Furthermore, metering is strictly enforced, meaning that unauthorized extractions are rare, according to Young. So, thanks to Australia’s accounting framework — which Young called “robust” in an interview with Circle of Blue — users looking for more water in a catchment area cannot just take it from the environment. Rather, any user seeking access to a larger volume of naturally occurring water, whether from an aquifer or a river, must convince someone else to sell some allocations for use this year or entitlement shares for use this year and every year hereafter. “That’s what sustainability is about,” Young said. The key, however, is finding the right price. Some users may decide it is most economical to buy or sell water shares, while others decide to manage their own shares more efficiently. Still others look for outside sources, like purchasing water from a desalinator or importer, since state-enforced limits only apply to naturally occurring water. “Proper pricing means [water] is properly valued and goes to where it’s needed most,” said Peggy Wong, Australia’s minister for finance and deregulation, when she served on a panel in August at the Brookings Institution in Washington, D.C.
High-security Rights: Farms with permanent plantings — like vineyards and orchards — tend to hold high-security rights, which promise a full supply of promised water 95 percent of the time. General Rights: Annual crop farmers — growers of cotton, rice, and similar seasonal crops — tend to purchase general-security supplies, which vary from 30 to 80 percent reliability, depending on the river that is supplying the water. Low-security Rights: These are only available to irrigators when river levels are abnormally high, whether from flooding or unusual rainfall. Entitlement turnovers across Australia average $US 2 billion per year, or triple the total annual turnover from five to six years ago, Morison told Circle of Blue. High-security entitlements, the most expensive, ranged in price from $US 1,000 per 1,000 cubic meters to $US 3,000 per 1,000 cubic meters (about $US 380 per 100,000 gallons to $1,150 per 100,000 gallons) during that period. Today, however, prices for one-time purchases, or allocations, fluctuate dramatically in the Murray-Darling Basin. The Darling River and canals near Menindee in New South Wales, Australia, during the height of The Big Dry in 2009. Click image to enlarge. “That’s a function of how much water is available and whether or not it’s expected to rain,” said Young, who can remember prices as low as $US 10 per 1,000 cubic meters to as high as $US 1,200 per 1,000 cubic meters ($US3.80 per 100,000 gallons to $450 per 100,000 gallons) in the late 2000s, the peak of ten-year drought known as The Big Dry. Already running low on water, farmers are still fighting back against the federal government’s water-rights purchases for the environment, despite the fact that the Australian government passed a permanent plan for the Murray-Darling in November. The problem is not so much that the federal government buys water for the environment — that model spawned the Murray-Darling’s rights-trading market system and has successfully mitigated serious water stress in the Basin by reclaiming more than 100 million cubic meters (26 billion gallons) of water in the past 5 years (see Murray-Darling sidebar). More troublesome is who the government buys water from, how much is purchased, and when the water is purchased, according to Wes Strickland, a California-based lawyer who focuses on water resources and infrastructure issues. Strickland follows Australia’s market system closely. For instance, whenever the government bought a large volume of water at once, Strickland told Circle of Blue, people in the agricultural industry complained. Why? Because those government purchases immediately spiked demand for sales of water rights, since less was now available for irrigation, and that increased demand drove costs up — potentially too high for farmers to buy the water that they needed. Farmer Gilbert Bain harvests wheat in 2009 on withered fields that were once rice paddies. Click image to enlarge. Charles Fishman, author of The Big Thirst, interviewed Laurie Arthur, one of the Murray-Darling’s biggest rice farmers. Arthur owned the permanent, recurring rights — or entitlements — to 6 million cubic meters (1.5 billion gallons) of irrigated water from the Murray River every year. That is enough to fill a valley that is nearly 1 kilometer wide by 2.5 kilometers long with close to three meters (or half a mile wide by 1.5 miles long with 10 feet) of water. But from 2007 to 2009, Arthur received only a fraction of that total entitlement, since so little water was available in the Basin. To recoup some of his losses, he sold a tiny part of his entitlement — 3 percent of his shares — to the government for almost $US 200,000. He permanently lost the rights to that water, but he spent the money on infrastructure investments like upgrading his irrigation pipelines. When Fishman visited Arthur in 2009, with follow-ups in 2010 and 2011, the farmer had not yet sold any more of his entitlement, betting that the rains would come back. The bet was a substantial one — the $US 2 million worth of capital that Arthur invested in his farm all depended on the rain coming back. His bet — at least in part — paid off. In 2011, the drought broke “in a big way,” Fishman wrote to Circle of Blue, returning water to Arthur’s land and flooding the Murray River. But before the rains returned, Arthur had moved some of his operation to remote northwestern Australia. While “he is doing fine,” Fishman said, Arthur is still in transition, balancing both his farms. “The government seems to be learning how to spread its purchases out over time and get rid of that, to some extent,” Strickland said. But there is broader resistance in the agricultural community, according to Strickland, because the majority of government buy-backs come out of that sector. “The ag community, in general, does feel threatened by the whole enterprise,” Strickland said. Morison of Blue Sky Investments sees a broad trend emerging in Australian agriculture — a shift away from seasonal farms growing crops like grains and cotton toward permanent, high-end farming operations like vineyards. This is not surprising, since the market system gives permanent croppers the ability to bid water rights away from their seasonal counterparts. In other words, despite that permanent croppers pay more for high-security rights that are in the most expensive bracket, their returns are higher than those of seasonal farmers who opt for less expensive general rights. Irrigators who grow pastures to feed beef cattle or sheep for slaughter might derive a return of only $US 100 per 1,000 cubic meters ($US 38 per 100,000 gallons), Morison said. But permanent agriculture and horticulture see returns closer to $US 1000 per 1,000 cubic meters ($380 per 100,000 gallons), making their business model more viable in Australia’s water-trading environment. The trend first emerged during The Big Dry, from 2001 to 2010, when water was traded very actively within and across state borders. “That allowed permanent agriculture to survive, while annual crops like cotton and rice declined massively,” Morison said. Farmers are not alone in their dependence on water, vulnerability to scarcity, and close ties to governmental involvement in the water market. 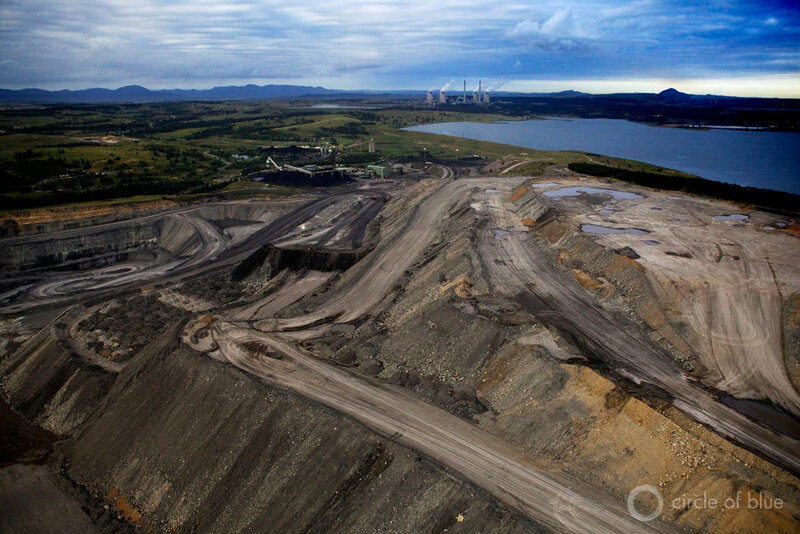 Australia’s mining industry is heavily dependent on the country’s water resources. And that fact makes operators apprehensive about the next few decades, even though business is currently booming. Australia is the world’s top coal and fourth-largest liquefied natural gas exporter, mostly to neighboring Asian countries like Japan, South Korea, Taiwan, and now increasingly to China and India, as well. A view over an open-cut coal mine in New South Wales, where thousands of miners work 24/7 to haul black coal out of the ground. Click image to enlarge. Demand from Asia is projected to increase in the coming years, which should mean more business for Australia. But freshwater supplies will limit that potential growth, according to Wong, currently Australia’s minister for finance and deregulation who served as minister for climate change and water during The Big Dry. For instance, the coal seam gas (CSG) industry could pump between two and nine times more water in the next 25 to 35 years than the entire mining industry currently uses in Queensland and New South Wales — notably the Australian states where the new CSG industry is now booming. Two major industrial companies operating in Australia today, BHP Billiton and Santos, are exemplary water managers, Young told Circle of Blue. Each uses water-saving practices that other companies could learn from in the coming years, as water demand from the mining industry outpaces water supply. BHP Billiton, a company with more than 100 years of operating history in Australia, has focused on desalination to reach beyond their entitlement limits. Meanwhile, Young said that Santos, founded in Australia in 1954, uses relatively small water volumes and emphasizes careful water management in their 2011 sustainability report. But best practices designed independently by companies will only go so far. Looking into the future, Young said, regulation will be important in determining how well Australia’s water-rights trading market balances growing mining demands with agricultural and municipal needs. State and federal market regulations will need to protect environmental flows, make sure entitlement holders use only the volumes they are permitted to use, and facilitate the actual movement of water between traders without squashing the market’s overall activity, according to the 2011 National Water Commission report. However, a March 2012 report from the National Water Commission found that mining operations were not yet fully integrated into water-planning processes and markets. The hurdles preventing full market integration include unsteady water supplies, different laws between the mining industry, the supervising state governments, national water regulations, and the complete lack of water markets in some mining areas. Added to the tectonic shifts in farming and mining caused by limited water supplies and domestic policies are foreign investors. One flashpoint — the 2012 sale of Cubbie Station, Australia’s largest cotton farm to a Chinese textile group — illustrates how non-Australian water purchasers are changing in-country resource rights and business culture (see Cubbie sidebar). Cubbie Sale: A Missed Opportunity? Cubbie Station is the largest privately owned irrigation property in the southern hemisphere, sustaining about $US 50 million a year in crops like cotton and wheat. The station was created in 1983 and has since amassed 12 floodplain properties covering 93,000 hectares (about 230,000 acres) in southwest Queensland. The mega-farm’s 51 water licenses entitle it to 460 million cubic meters (121 billion gallons) of water each year from the Culgoa and Balonne Rivers — tributaries of the Murray-Darling Basin — and there is the capacity to store a total of 537 million cubic meters (142 billion gallons), enough water to fill Sydney Harbor. Cubbie Station does not always receive the amount of water it is entitled to, however, because allocations can be reduced during drought years. Regardless, Cubbie’s large entitlements have long been a source of bitterness for small irrigators downstream of the mega-farm, according to the Australian Broadcasting Corporation (ABC). The station’s huge withdrawals also make it a frequent scapegoat for problems in the Murray-Darling Basin. Conservationists and downstream irrigators alike had hoped that the government would buy back the water rights associated with Cubbie Station, putting these entitlements toward the 2.75 billion cubic meters (725 billion gallons) that are required by the plan for the Basin’s environmental flows that passed in November. The Australian government has a $US 3.3 billion fund set up for just that purpose, and, as of April 2011, it had purchased 977 million cubic meters (258 billion gallons) of water entitlements worth $US 1.67 billion from other irrigators within the Basin. So when the Australian Treasurer approved the sale of both the land and the water rights in September 2012 to Chinese textile group Shandong Ruyi for an approximate $US 314 million — which will buy the company an 80 percent stake, with stipulations to reduce its share to 51 percent over the next three years — the decision was criticized as a missed opportunity to send more water flowing down the river, according to The Australian. Politicians from Queensland and New South Wales, as well as residents living near Cubbie Station, have expressed concerns that the foreign owners may change how business is done in the local cotton industry that is the region’s lifeblood, the Australian Broadcast Company reported. Over the past few years, large-scale agricultural land investments around the world have increased dramatically as private investors and governments look to secure food supplies and cash in on high global commodity prices. Many of these so-called “land grabs” have occurred in Africa, but they have also become a contentious issue in Australia, fostering fears about food and water security. According to a recent government study, those fears are overblown. 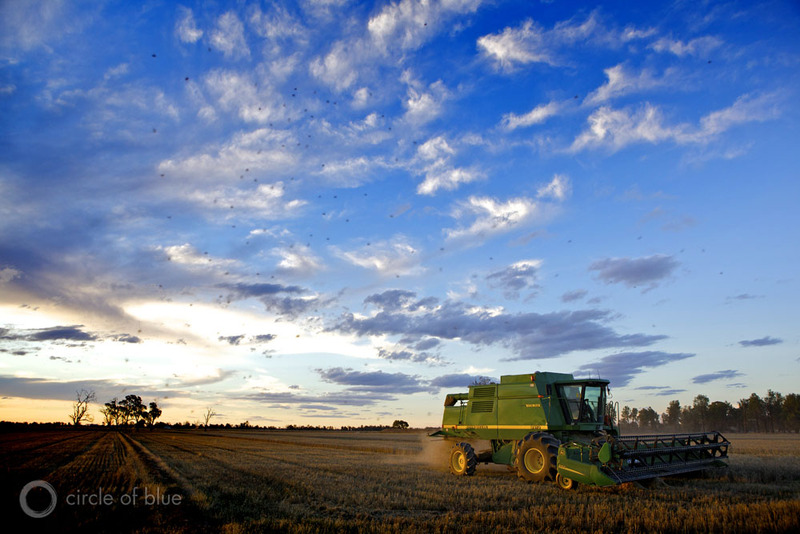 As of December 2010, only 11.3 percent of Australia’s agricultural land was wholly or partly owned by foreigners. Of that, about half had majority Australian ownership. Moreover, the study found that 91 percent of water entitlements were fully owned by Australians. The authors concluded that foreign investment was critical for further developing the country’s agricultural sector and that foreign involvement would be more likely to improve food security than to reduce it. The United Nations Food and Agriculture Organization (FAO) would agree. The agency, in a joint conference with the European Bank for Reconstruction and Development (EBRD) in September 2012, stated that private-sector investment is key to fighting hunger and food insecurity. Nonetheless, the Cubbie Station sale highlights yet another dimension of the important tug-of-war over who should own the agricultural sector’s water in Australia and in what proportions: the government or private users, both foreign and domestic. The viability of Australia’s entire water management system met its latest and most substantial test in November when the federal government — after years of debate — passed the Murray-Darling Basin Plan. The plan is an authoritative set of water-use regulations that determine how much water in the Murray-Darling will be reserved for the environment. Now, two months into the life of the young law, some Basin states are already contesting elements of the federal plan. Yet, despite the divisive, unresolved issues, Young believes that pricing within Australia’s water-rights trading system will play a major role in managing the nation’s water resources as agriculture shifts, mining expands, and foreign investment continues. By way of disclosure, I’m CEO of NSW Irrigators Council – a policy and advocacy group for irrigators in the largest irrigation state in the Murray Darling Basin. Thanks for the article, Andrew – it’s an interesting perspective on Australia’s market mechanism. “Peggy Wong” is actually Senator Penny Wong. “The other half of the total available water in any Australian basin is divided into individual, useable entitlements”. It’s a long way from 50%. The Basin Plan will see around one third pre-development considitions end of system flow in each river. That means considerably less than 33% will be extracted. “Once the government own water, individuals users cannot purchase it back.” The Water Act specifically allows the governments water holder (the Commonwealth Environmental Water Holder) to engage in trade. They’re recently published a discussion document on it to which a range of groups – including us – have lodged submissions in response. Mr Strickland is quoted as saying “the ag community, in general, does feel threatened by the whole enterprise.” If the reference is to government moves to reduce the amount of water available for productive use, he’s spot on we feel threatened. We’re not, however, threatened by the development of a market – far from it. Irrigators were instrumental in moving to a market based system – NSW Irrigators Council was founded on the principle of establishing an indefeasible property right in water (which is obviously a precursor to a market). The story suggests Mr Morrison contents the development of a market has seen a move away from annual to permanent crops. I’m not at all certain Mr Morrison would have stated as such as there’s absolutely no evidence to support it. I suspect what he said was annual cropping declines during periods of low availability as water moves to those willing to pay high prices to protect permanent plantings (often operating at a short term loss to achieve that). The evidence clearly suggests that when water is available, annual cropping flourishes (as it has in the past two seasons). To a more general comment on the article – water users in the Murray-Darling Basin are very happy with the development of the market as it has given them a permanent, indefeasible property right. That was the main benefit for them – the existence of a market is secondary to it. Water users elsewhere should be pursuing exactly the same property right to underpin their primary asset. The existence of a market, though, is a little more tricky. Professor Young has recently advised the UK Government to establish a market approach there – something which we responded shoudl be cautiously approached. Why? Simple – markets must have liquidity to operate efficiently and effectively. It’s in the southern Murray-Darling Basin that trade is working; and that’s only because of the volumes that can be achieved via size. In small, short run systems with limited market participants, caution needs to be exercised.